SPEARHEAD has formally apologised for a botched operation in which a member of the town council of Binalonan, Pangasinan, Philippines was left critically injured. Cllr Juan Lakarin is a member of the council who along with Mayor Ramon Guico III and fellow officials have been luring residents to a blood drive using social media and a sense of fun. 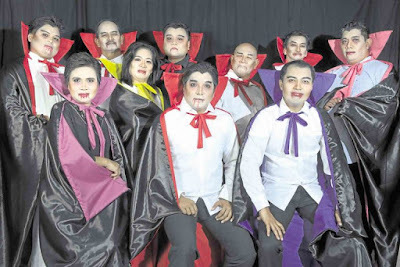 Complete with fangs, capes and fake blood they're been posing as vampires and making social media videos for their off the wall marketing stunt designed to attract blood donors. Unfortunately when an uninformed resident spotted Cllr Lakarin in costume they called the emergency services who routed the call to the SPEARHEAD field office in Manila who dispatched Counter-Vampire Strike Team - Epsilon who subsequently shot Cllr Lakarin with UV bullets. "It was an honest mistake," said Master Warrant Officer “Chatterbox” Hendrickx of the SPEARHEAD Public Affairs office "and it's not like the worst thing that's happened in the Philippines recently, right?"